Fabulous look!! Good quality fabric that doesn't wrinkle. Goes great in my contemporary bedroom with silver and crystal accents, but not gaudy. Highly recommend. Freshen up your bedroom with the enchanting style of Intelligent Design's Khloe Comforter Set. 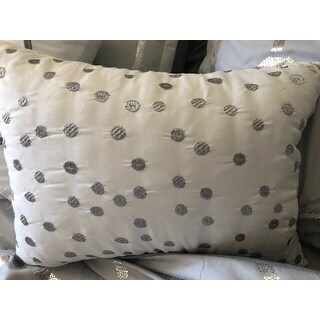 The stunning comforter flaunts a geometric, metallic print against a soft ground for a fun and eye-catching look! Matching sham(s) echo the design seen on top of the bed to pull the entire ensemble together. 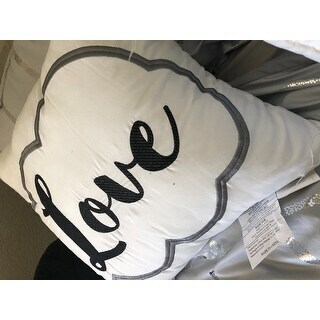 Two embroidered decorative pillows with typography and metallic details complete this fabulous, ultra-soft microfiber comforter set.Set includes comforter, 2 shams (1 sham in Twin/ Twin XL), 1 oblong and 1 square decorative pillows. This is terrible and very disappointing. My daughter was so excited when she saw this set on this site and she asked everyday if it was delivered yet. We finally received it today and she was so sad when she put it on her bed. The color is not the same and it was extremely wrinkled. The set did not look as beautiful as it did on the site. I was going to send it back, but my humbled daughter said she'll just keep it and get another set in a few months. Perfect for summer. Shinier than what the picture shows. Delivery was quick. The set is so beautiful. Love it. Bought it as a present for my parents new home. They absolutely love it and couldn’t be more happy. 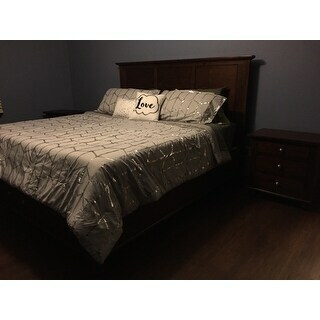 Pretty comforter shiny, will fit a full size bed great but not a king size. 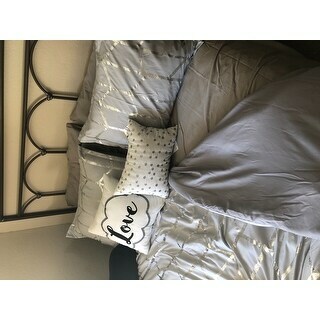 Absolove this comforter! Very soft, even the shiny part. "Would I have to pay for return shipping"
"Does this come with sheets as well?" "What are the washing instructions "
"Is the ivory/gold a different color?" "I do not see a bedskirt as part of the set. Does it come with one?" No, a matching bed skirt is not available at this time. No bed skirt comes with it. "Do you have this in Queen size?" "Will the twin xl fit college dorm beds?" Most dorm beds are Twin XL's so yes it should fit. For your own reference the measurements of the Twin XL comforter are 68 inches wide x 90 inches long.